Objective: Hepatitis C virus (HCV) infection has long been treated with interferon therapy (IFN). Currently, more than 90% of IFN-treated patients show a sustained virological response (SVR) when also treated with ribavirin and/or a protease inhibitor. Histological inflammation and fibrosis improve in IFN-treated patients, which indicates HCV clearance. IFN also reduces the incidence of hepatocellular carcinoma (HCC). However, a small proportion of patients with SVR develop HCC. To investigate the causes of hepatic carcinogenesis after SVR, we compared the liver histological findings before IFN to those after the development of HCC. 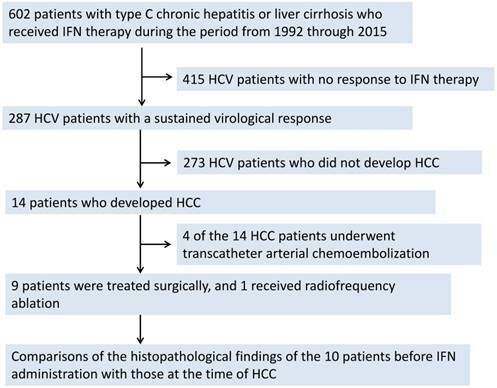 Patients and methods: In total, 602 patients infected with type C chronic hepatitis or with liver cirrhosis who received IFN therapy during the period from 1992 through 2015 were included in this study. We assessed 14 of the 287 patients who achieved an SVR. Results: HCC was diagnosed by computed tomography, angiography or liver biopsy. The longest time from the SVR until HCC detection was 16.5 years, and the mean was 7.2±4.6 years. Nine of the 14 patients underwent surgery and one radiofrequency ablation. The histological findings of 10 patients were available for comparison. 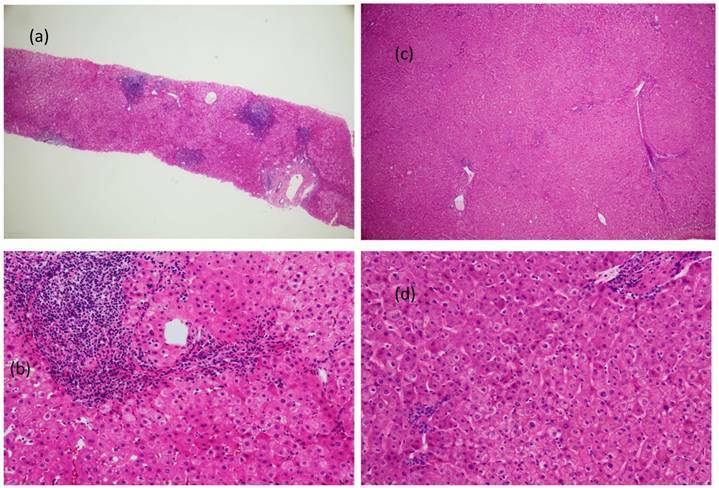 The comparison of the histological findings before treatment with those after the HCC diagnosis revealed an amelioration of liver fibrosis and other inflammatory changes. All ten patients showed improvements in fibrosis and steatosis. However, we observed that mild inflammatory change persisted from 1.8 years to 16.5 years after the confirmation of SVR in all cases. Conclusion: We suspect that persistent histological inflammation is one of the factors contributing to hepatocarcinogenesis (i.e., HCC development) even after successful treatment. Keywords: Chronic Hepatitis C, Sustained Virological Response, Hepatocellular Carcinoma, Histological Fibrosis, Persistent Histological Inflammation. The estimated prevalence of hepatitis C virus (HCV) ranges from 2.3% to 2.8% worldwide . HCV is a major cause of liver disease. In the United States and Japan, approximately 25% of infected patients develop hepatocellular carcinoma (HCC) and/or other forms of decompensated liver disease [2, 3]. Interferon (IFN) monotherapy has long been the mainstay of initial treatment for patients with chronic hepatitis C infection . The next therapeutic advancement was ribavirin (RBV) combined with IFN or PEGylated IFN, a treatment regimen that achieved marked improvements in cure rates. In 2013, in an effort to increase the cure rate, the IFN plus RBV and a protease inhibitor (simeprevir) therapy was launched in Japan. Genotype 1b HCV patients achieved sustained virological response (SVR) rates exceeding 90% with this triple therapy regimen . However, this therapeutic regimen was relatively ineffective in patients with a single IL28B nucleotide polymorphism . Recently, direct acting antivirals (DAAs), exemplified by drugs such as Sofosbuvir and ledipasvir, reportedly have been achieving SVR rates of 95% to 100% [7-9]. In patients achieving SVR, improvements in liver function were demonstrated by reductions in aspartate transaminase (AST) and alanine transaminase (ALT) levels [10-12]. Histological improvement also has been documented in patients achieving SVR. Anti-viral therapies such as IFN contribute to the amelioration of hepatic inflammation and fibrosis [10-14]. On occasion, HCV-infected patients showing an SVR in response to IFN develop HCC. According to one report, in patients greater than 65 years of age, there is no difference in the cumulative rates of hepatocarcinogenesis between those with an SVR and those who are non-responders to IFN . After surgery for HCC, anti-viral therapy reportedly suppresses the recurrence of HCC . These reports indicate that IFN therapy also suppresses the development of HCC. However, a small number of SVR patients develop HCC . Our present study aimed to investigate the causes of carcinogenesis in chronic hepatitis C patients with an SVR. We compared the histological findings before the administration of regimens including IFN to those at the time of the HCC diagnosis in patients with hepatitis C showing an SVR. A total of 602 patients with type C chronic hepatitis or liver cirrhosis who visited the Division of Gastroenterology and Hepatology at Nihon University Hospital to receive IFN therapy during the period from 1992 through 2015 were included in this study. For patients who were added to the study population from 2009 through 2012, combination therapy with Peg-IFN-α2a or Peg-IFN-α2b and RBV was administered for 6-12 months. From January 2015 to December 2015, combination therapy with Peg-IFN-α2a or Peg-IFN-α2b and RBV was administered for 24 weeks, followed by simeprevir for 12 weeks. We previously reported the results that were obtained . We considered an SVR to have been achieved in those patients who remained negative for serum HCV RNA for > 24 weeks after the completion of IFN therapy (Figure 1). At the time of starting the IFN administration, we measured the serum AST, ALT and γ-glutamyltransferase levels (U/L) and determined the serum platelet count (× 104/μL) and HCV genotype. All patients gave informed consent to be included in this study, in accordance with the Declaration of Helsinki. All patients were positive for the HCV antigen (by 2nd generation ELISA; Abbot, Tokyo, Japan) but negative for the serum hepatitis B surface antigen (by HBsAg ELISA; Abbot), anti-nuclear antibody (by indirect immunofluorescence assay, IF; Special Reference Laboratory, Tokyo, Japan), anti-smooth muscle antibody (by IF), and anti-mitochondrial antibody (by IF). We confirmed HCV positivity and measured the HCV RNA levels in the blood samples using the competitive reverse transcriptase-polymerase chain reaction and DNA probe methods (Special Reference Laboratory, Tokyo, Japan) and the Amplicor monitoring method (Amplicor HCV Monitor, Roche Diagnostic K.K., Tokyo, Japan) or Cobas TaqMan HCV method (Roche Diagnostics, Meylan, France). Patients with Child B or Child C cirrhosis and those with a co-infection with the human immunodeficiency virus were excluded. Before the IFN treatment, the absence of malignant diseases was confirmed by blood biochemical, ultrasound, chest X-ray and endoscopy examinations. Malignancy was an exclusion criterion. The liver tissues of the patients were intraoperatively harvested or obtained by needle biopsy. These tissue specimens were fixed in 2.5% formalin, embedded in paraffin, sectioned into 3-4 μm slices, and stained with hematoxylin and eosin (H&E). The fibrosis severity and activity scores were determined by the methods of Desmet , Knodell  and Ishak , as previously reported. Fibrosis was staged as F0 (no fibrosis), F1 (fibrous portal expansion), F2 (bridging fibrosis), F3 (bridging fibrosis with architectural distortion), and F4 (cirrhosis). The activity scores were graded as A0 (no activity), A1 (mild activity), A2 (moderate activity) and A3 (severe activity). The scores of all biopsy specimens were independently assigned by the first author and one co-author (MM) without knowledge of the clinical characteristics of the patients. The resected specimens were examined in detail. In all cases, the sites in the non-cancerous portion were examined at a distance of greater than 10 mm from the tumor. Gender and genotype were compared using the χ2 test for independence. Liver histopathological findings and activity scores were compared using the Wilcoxon signed-ranks test. The remaining parameters are shown as the mean ± SD and were compared using Student's t-test. These analyses were performed using JMP software (SAS Institute, Cary, NC). P values less than 0.05 were considered to indicate statistically significant differences. Figure 1 shows the flow chart for our subjects. Two hundred and eighty-seven patients (174 males and 113 females) achieved an SVR when treated with IFN. Fourteen of these patients developed HCC. Four of these 14 HCC patients underwent transcatheter arterial chemoembolization. Nine patients were surgically treated, and one received radiofrequency ablation. The comparison of the histopathological findings before the IFN administration with those at the time of the HCC surgery for 10 patients was thus possible. Nine of these 10 patients were male. The mean age of the patients at the time of the IFN administration was 61±6 years, while that at the time of the HCC surgery was 67±6 years. As shown in Table 1, we compared the laboratory data of the 10 patients before IFN with those at the time of the HCC diagnosis. The AST (60±21 U/L vs. 23±24 U/L, p<0.01) and ALT (66±20 U/L vs. 22±12 U/L, p<0.01) levels were both reduced at the time of the HCC diagnosis compared to the pretreatment levels. There were no significant changes in the alkaline phosphatase (ALP) level (259±142 U/L vs. 242±60 U/L, p=0.49), gamma-glutamyltransferase level (55±23 U/L vs. 46±31 U/L, p=0.47), total bilirubin level (0.6±1.2 mg/dL vs. 0.7±0.4 mg/dL, p=0.34), albumin level (4.3±0.7 g/dL vs. 4.2±0.3 g/dL, p=0.61), prothrombin time (94±6% vs. 96±0.4%, p=0.33), platelet count (15.9×104/mm3±5.0×104/mm3 vs. 17.6×104/mm3±3.8 ×104/mm3, p=0.30) or alpha-fetoprotein (AFP) level (7.9±3.4 ng/mL vs. 7.2±10.7 ng/mL, p=0.12). These data differed minimally between the time point of the SVR confirmation and when HCC was detected. Six patients had HCV genotype 1b, 3 had HCV genotype 2a and 1 had HCV genotype 2b. None of the 10 patients tested positive for Hepatitis B virus (HBV) DNA by the TaqMan polymerase chain reaction. Four of the patients were positive for HB surface antibodies (HBsAb), and 5 were positive for HB core antibodies (HBcAb). Comparisons of laboratory data collected from 10 patients before IFN treatment and after HCC resection. To compare the histological scores, we checked the Fib-4 index (Table 2). However, there were no significant changes (p=0.96). Figure 2 (a, b, c, and d) shows the carcinogenic changes documented approximately 3.7 years after the confirmation of an SVR in an IFN-treated patient (Table 3; Patient No. 4). Figure 2a shows an H&E-stained specimen at ×4 magnification, while Figure 2b shows an H&E-stained specimen at ×20 magnification. Both of these images were obtained prior to IFN administration. Figure 2c shows an H&E-stained specimen at ×4 magnification, while Figure 2d shows an H&E-stained specimen at ×20 magnification. Both of these images were obtained at the time of HCC resection. The fibrosis score shows a slight improvement. However, necrotic patches, as well as steatosis, can still be seen. A comparison of the histological scores in regards to the Fib-4 index. There were no significant changes observed (p=0.96). Figure 3 (a, b, c, and d) shows the carcinogenic changes documented approximately 8.5 years after the confirmation of an SVR in an IFN-treated patient (Table 3; Patient No. 8). The carcinogenic changes documented approximately 3.7 years after the confirmation of an SVR in an IFN-treated patient are shown. Figure 2a shows an H&E-stained specimen at ×4 magnification, while Figure 2b shows an H&E-stained specimen at ×20 magnification. Both images were obtained prior to IFN administration. Figure 2c shows an H&E-stained specimen at ×4 magnification, while Figure 2d shows an H&E-stained specimen at ×20 magnification. Both images were obtained at the time of HCC resection. The fibrosis score shows a slight improvement. However, necrotic patches, as well as steatosis, can still be seen. Figure 3a shows an H&E-stained specimen at ×4 magnification, while Figure 3b shows an H&E-stained specimen at ×20 magnification. Both of these images were obtained prior to IFN administration. Figure 3c shows an H&E-stained specimen at ×4 magnification, while Figure 4d shows an H&E-stained specimen at ×20 magnification. Both of these images were obtained during HCC resection. The fibrosis score showed an improvement from F4 to F3, and slight bridging necrosis was detected. Steatosis, as well as inflammation of the portal area, was still present. Figure 4 (a, b, c, and d) shows the carcinogenic changes documented approximately 16.5 years after the confirmation of an SVR in an IFN-treated patient (Table 3; Patient No. 10). Figure 4a shows an H&E-stained specimen at ×4 magnification, while Figure 4b shows an H&E-stained specimen at ×20 magnification. Both of these images were obtained before IFN administration. Figure 4c shows an H&E-stained specimen at ×4 magnification, while Figure 4d shows an H&E-stained specimen at ×20 magnification. Both of these were obtained during the surgery for HCC. The specimen that was obtained 16 years earlier clearly shows fibrosis. At the time of HCC resection, the fibrosis had improved from F3 to F1. Inflammation of the portal area was also reduced, though necrotic patches remained (Figure 4d). The inflammation within the parenchyma and necrosis showed improvement, but there were still areas that were affected. No lymphoid follicle formation was detected in the portal area. Table 3 shows the fibrosis grades of the patients before IFN treatment. One patient had stage F1, 2 had stage F2, 4 had stage F3, and 3 had stage F4. At the time of the HCC resection, 6 patients had stage F1, 1 had stage F2, 3 had stage F3, and none had stage F4. There were statistically significant differences between the fibrosis stages before IFN and at the time of surgery for HCC (P=0.01). None of the patients showed a worsening of fibrosis. Comparisons of fibrosis grades and inflammation activity scores before IFN treatment and after HCC resection. The differences were statistically significant (p=0.023). None of the patients showed an increase in either fibrosis grade nor activity score. Carcinogenic changes documented approximately 8.5 years after the confirmation of an SVR in an IFN-treated patient (corresponding to Patient No. 8; Table 3) are shown. Figure 3a shows an H&E-stained specimen at ×4 magnification, while Figure 3b shows an H&E-stained specimen at ×20 magnification. Both images were obtained prior to IFN administration. Figure 3c shows an H&E-stained specimen at ×4 magnification, while Figure 3d shows an H&E-stained specimen at ×20 magnification. Both images were obtained during HCC resection. The fibrosis score showed improvement from F4 to F3, and slight bridging necrosis was detected. Steatosis also showed marked improvement, but inflammation persisted in the portal area. Carcinogenic changes documented approximately 16.5 years after the confirmation of an SVR in an IFN-treated patient are shown. Figure 4a shows an H&E-stained specimen at ×4 magnification, while Figure 4b an H&E-stained specimen at ×20 magnification. Both images were obtained before IFN administration. Figure 4c shows an H&E-stained specimen at ×4 magnification, while Figure 4d shows an H&E-stained specimen at ×20 magnification. Both images were obtained during the surgery for HCC. The specimen that was obtained 16 years earlier clearly shows fibrosis. At the time of HCC resection, the fibrosis grade had improved from F3 to F1. The inflammation of the portal area was also reduced, though necrotic patches can still be seen in the specimen (Figure 4d). The inflammation within the parenchyma and necrosis showed improvement, but there were still areas that were affected. No lymphoid follicle formation was detected in the portal area. As for the activity scores before the IFN therapy, 1 patient had grade A1, 6 had grade A2, and 3 had grade A3. At the time of the HCC resection, 6 patients had grade A1 and 4 had grade A2. There were statistically significant differences between the activity scores before IFN and at the time of surgery for HCC (P=0.023). None of the patients showed a worsening of inflammation. However, all the patients had histological findings indicative of inflammation. Nine of the 10 patients had steatosis before IFN administration. Even after being treated with IFN, either alone or in combination with other agents, all 9 patients still had steatosis. Histological specimens that allow comparisons to be made between the findings prior to IFN treatment and those at the time of HCC resection are not widely available. One of the patients in the present study, who developed HCC with an SVR more than 16 years after the administration of IFN, is particularly rare and may provide insights into the long-term process of hepatic carcinogenesis. In our study, the shortest time between the IFN administration and HCC detection was 1.8 years. This patient showed no evidence of HCC on either computed tomography or ultrasonography prior to IFN treatment. While it is not possible to confirm that none of these 10 patients had HCC at the time of the SVR, the longest period from the SVR until HCC detection was 16.5 years, making carcinoma at the time of SVR confirmation extremely unlikely. Before starting this study, it was our view that histological inflammation would disappear completely after the attainment of an SVR. However, we observed that a mild inflammatory change persisted from 1.8 years to 16.5 years after the confirmation of an SVR in some cases. To our knowledge, there are no reports indicating that the HCV RNA genome becomes integrated into the human genome. HCV is apparently not carcinogenic on its own. We thus speculate that a prolonged histological inflammation is one of the causes of carcinogenesis and that it can be effective even after HCV has been eradicated. According to another report, very low levels of HCV may persist in hepatocytes. Maylin et al. reported that serum HCV RNA was negative but HCV RNA was detected in liver biopsy specimens from 2 of their 114 hepatitis C patients (1.7%) . The hepatocytes of our patients were not tested for HCV RNA, and we thus cannot rule out the possibility of there being low levels of the virus persisting in liver cells. The histological fibrosis of the patient diagnosed with HCC 1.8 years after attaining a SVR improved from F2 to F1. The patients who had liver cirrhosis 3.7 years and 6.6 years after IFN treatment showed improvements from F4 to F2 and from F4 to F1, respectively. In our patient with the longest period between IFN administration and HCC, which was 16.5 years, fibrosis had remarkably improved from F3 to F1. Thus, all of the patients showed an amelioration but not complete disappearance of fibrosis. 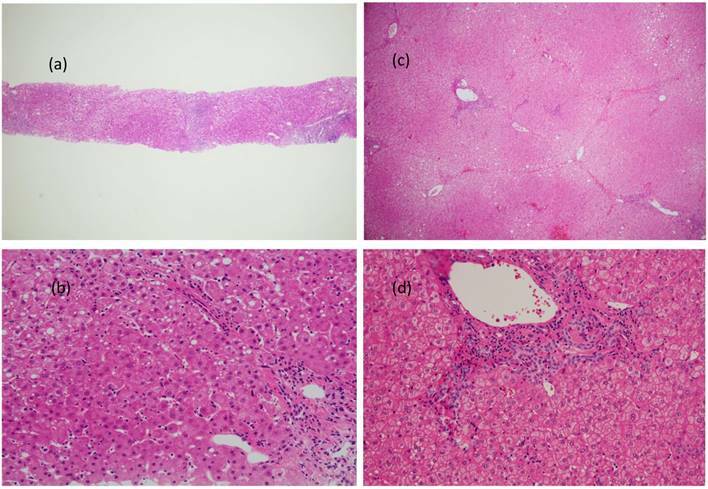 Comparisons of the histological features of patients with chronic hepatitis C before and after IFN treatment have been reported. Biopsies that were obtained after an SVR demonstrated that 57%-94% of hepatitis C patients with an SVR showed reductions of inflammation and fibrosis [10, 11, 13, 22]. However, according to some reports, 1%-14% of patients showed no changes in the histological findings [20, 22]. In this study, despite them both showing improvements, inflammation and fibrosis were still detectable in all patients. There are many reports describing diabetes and fatty liver as being involved in carcinogenesis [12, 13, 23, 24]. In all but one of our patients, steatosis also persisted after the confirmation of an SVR. 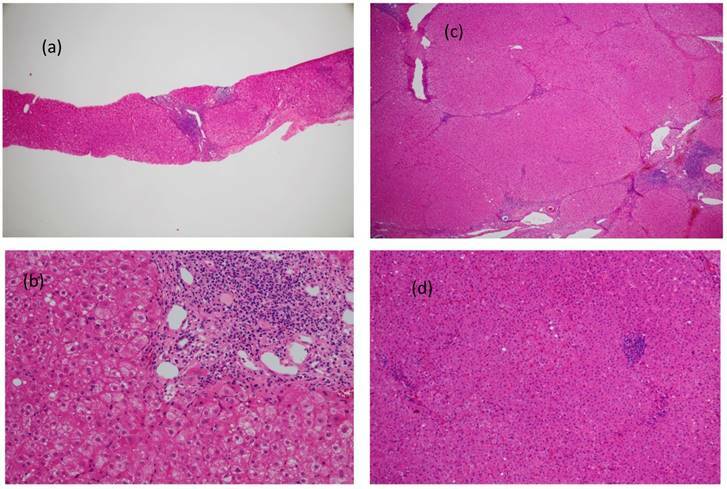 Previously, we reported that steatosis influences the clinical profiles and long-term outcomes of IFN-treated chronic hepatitis C and liver cirrhosis patients. In our present report, 12 of the 14 patients had steatosis of their liver tissues before IFN administration. 'Steatosis', 'lobular inflammation', 'hepatocyte ballooning', 'Mallory-Denk bodies', and 'fibrosis' were documented in our patients. However, at the time of the HCC resection, these histological findings were relatively mild. We thus suggest that steatosis is not a cause of residual and/or ongoing inflammation. Primary biliary cirrhosis and autoimmune hepatitis have also been suggested as being causes of inflammation in hepatitis C patients. However, in this study, all of the patients were negative for serum ANA and AMA M2 [anti-nuclear and anti-mitochondrial antibodies], making primary biliary cirrhosis and autoimmune hepatitis unlikely. However, neither can be definitively ruled out. We previously reported on occult HBV infection in HCV patients . According to one report, occult HBV infection is not associated with disease progression in patients with chronic HCV infection . HBV co-infection reportedly can also cause HCC. Of the previously reported HCC patients, there is a greater number of those who were positive for HBsAb and HBcAb than those who were negative for HBsAb and HBcAb. HCV patients who were HBcAb positive developed HCC at a higher rate than those who were HBcAb negative. Even among those HCV patients who were HBsAb negative, being HBcAb positive was reported as being a poor prognostic factor [25, 27, 28]. In this study, all of the included patients were negative for serum HBs antigen and HBV DNA, which was evidenced by the TaqMan polymerase chain reaction. Six of the 10 patients were positive for HBcAb. These 6 patients had occult HBV infection but HBV activity that was not high. The other 4 patients were negative for HBV markers and thus did not have occult HBV infection. HBV would therefore be an unlikely source of the histological inflammation in our patients. Of the 10 patients in our study, none were heavy alcohol drinkers, and there seems to be no relationship between alcohol drinking and the histological findings. Compared to the pretreatment levels, the AST and ALT levels after the HCC diagnosis were both reduced (P<0.01), while the glutamic-pyruvic transaminase level, total bilirubin level, ALP level, albumin level, platelet counts and prothrombin time were essentially unchanged. All of the patients had normal AFP values before starting IFN treatment. After HCC detection, only one patient was positive for AFP (37.5 ng/dL). Therefore, it was difficult to predict HCC solely based on the blood test findings. The platelet count after an SVR, which was measured during the HCC treatment, was not improved (p=0.33) from that before IFN. Furthermore, the Fib-4 index showed no statistically significant difference after an SVR compared to before IFN (p=0.96) (Table 2). We suggest that HCC that develops after an SVR is not able to be predicted by the patient's laboratory data. Makiyama et al. reported that of 3262 HCV patients treated with IFN, 1197 (37%) attained an SVR. During follow-up, 27 of these patients (2.3%) developed HCC. The cumulative HCC incidence was unrelated to both the serum transaminase levels and histological staging . Our findings also suggest that HCC that develops after an SVR is not able to be predicted by the patient's laboratory data. In another study that focuses on the prognosis of patients who develop HCC after an SVR, 8147 HCV patients treated with IFN were followed up for 6 years. The HCC occurrence rate was 0.64%/year in the HCV patient population. Patients who had liver cirrhosis and those who were older than 50 years were at a high risk of carcinogenesis . All of the HCC patients in our study were also older than 50 years. The prior report and our present data suggest that patients with liver cirrhosis and those older than 50 years should receive a meticulous long-term follow-up. Furthermore, the inflammatory histological findings did not correspond to abnormalities of the laboratory data. Ikeda reported on 7715 HCV patients who showed an eradication of HCV in response to IFN. Thirty-eight of these patients developed HCC later on. The follow-up for the patients was nearly 8 years. Compared to those without HCC, the patients who developed HCC showed high histological activity in the biopsy specimens . In our present study, the patients who achieved an SVR did not necessarily show high histological activity prior to IFN treatment. Recently, DAAs such as Sofosbuvir and ledipasvir have become mainstays of treatment. These drugs have achieved SVR rates exceeding 95% [7-9]. Toyoda et al. reported that patients who received DAA drugs after the confirmation of an SVR were at a higher risk for HCC than those who were given IFN. Their report suggests that IFN-based and IFN-free therapies should be compared in terms of hepatocarcinogenesis suppression along with HCV eradication . As for HCV treatment with DAAs, the development of HCC is reportedly suppressed in patients with an SVR who have been treated with DAAs . However, in other reports, the development of HCC did not appear to be suppressed in those receiving treatment with DAAs [33, 34]. This issue merits further study. Histological examination of the non-cancerous areas around an HCC after an SVR obtained with direct-acting antiviral drugs might be very useful for an optimal treatment selection. We plan to have a long-term follow-up of the patients treated with DAAs in our study. If such patients develop HCC, their histological findings before treatment should be compared with those of the resected HCC specimen. The authors would like to thank all of the patients and the research and clinic staff members of the Liver Unit of the Nihon University School of Medicine. The study protocol number of our institute is RK 10091015.